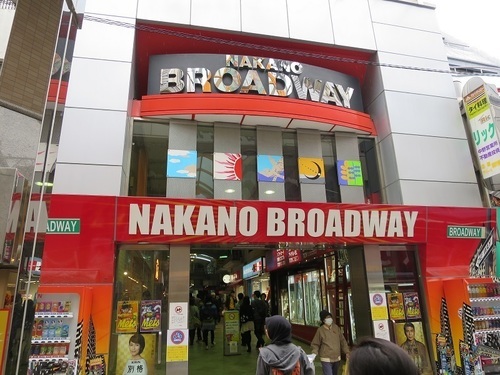 ‘Nakano Broadway’ in Nakano-ku, Tokyo, is known as a Geek Holy Land a bit different from ‘Akihabara’. Nakano Broadway is made up of a commercial area from the first basement floor to the forth, and an apartment house from the fifth floor to the tenth. Almost 50 year old building though, the total floor space of the commercial zone reaches 27,000 square meters. Because many animation production companies were found along JR Chuo-line where this building stands, ‘Mandarake’ opened its first shop here in the 1980’s when ‘For Rent’ signs began to stick out in this building. Mandarake is known for a nation-wide shop buying and selling secondhand comic books, comic-related goods, figures and secondhand character goods, however this shop was born here as a tiny shop dealing in secondhand comic books. Other similar shops followed this shop to change Nakano Broadway into a full-fledged holy land for geeks.